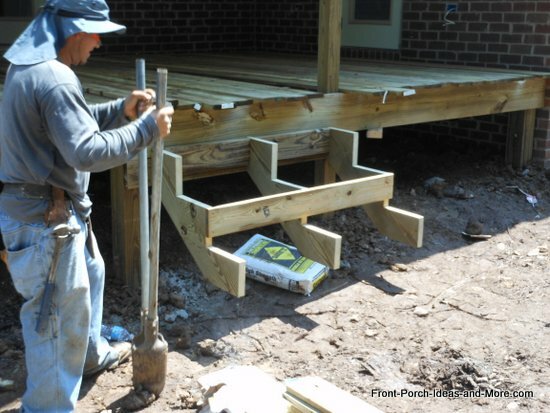 Learning how to build steps for your porch may look difficult but this video along with our tips and suggestions will make it fairly easy to do. As with most things there is more than one way to build them. But the basic steps (no pun intended) are the same. You'll learn about stringers, risers, run, treads, and how to properly mark and cut the stringers. Marking stringers always seems to be a bit confusing; this video and additional information will walk you through the process. 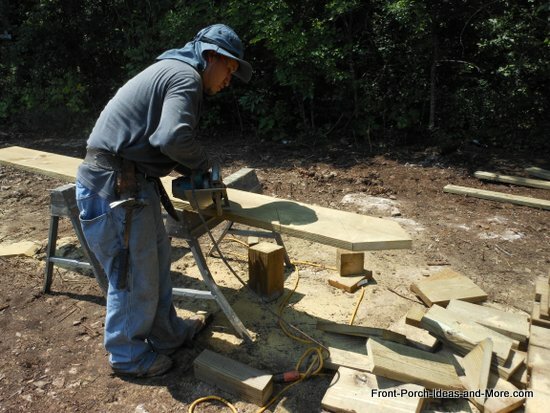 The process for how to build steps process can seem daunting at times. 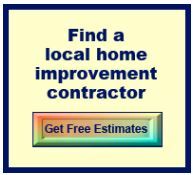 However, once you understand how to calculate the number and size of the steps, the construction is rather easy. 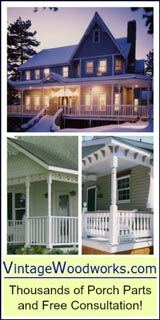 Before you begin, always check with your local building codes department to learn what specific requirements must be met. 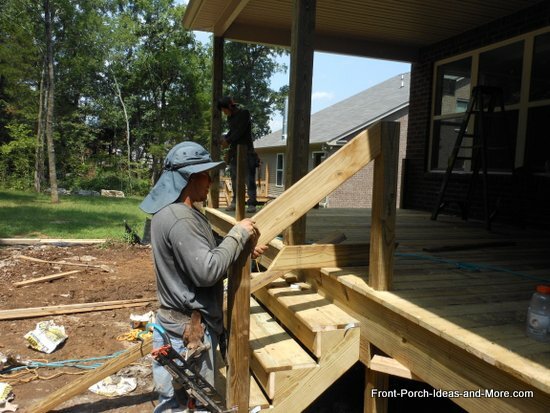 The following are general guidelines for building porch steps. As guidelines, they should not be used as instructions as each project has its own unique issues. 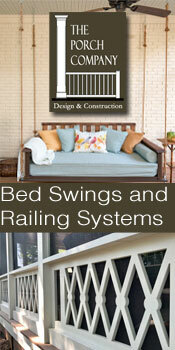 In addition, consult with your local building codes department to determine the requirements for your specific area. 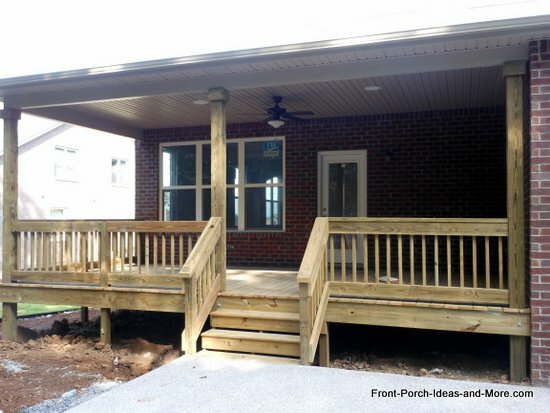 Example: If the porch floor is 87 inches from the ground, divide 87 by 7.5 to get 11.6 steps. Round up to get 12 steps. Divide the height in inches by the number of steps. In our example, 87 inches divided by 12 steps equals 7.25 inches. The risers will be 7.25 inches high. Standard stair tread depth is 10 inches but you can make them larger. 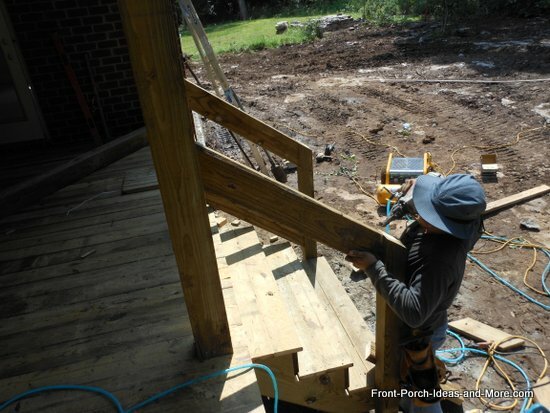 Use the depth of the stair tread to determine how far you stairs will extend into your yard. Multiply the number of steps by the depth of steps. Using our example 12 steps x 10 inches = 120 inches or 10 feet. 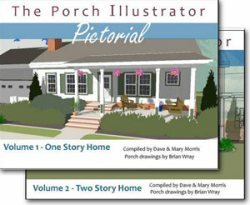 The staircase will extend 10 feet from the porch. The bottom of the steps must be secure. 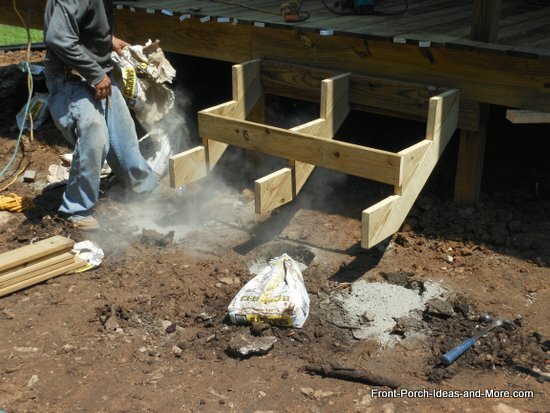 Dig and pour footings to accept posts (to stabilize the steps and support the railings). The footings must extend below the frost line and are normally at least 16 inches wide. 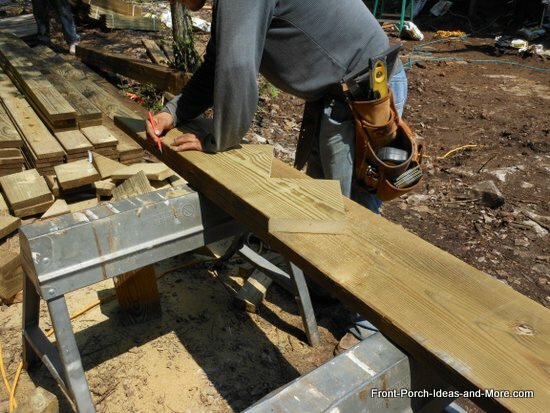 This often gives most people pause; laying out the stringers. Use the information below along with the video above and you shouldn't have any problem. 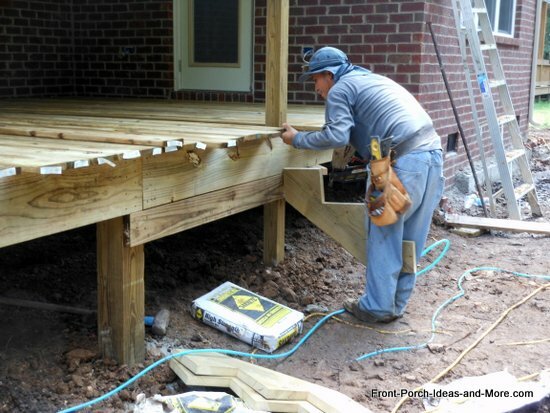 Use 2"x12" boards and measure the top step. If the rise of your steps is 7-1/4 inches place a framing square at one corner of the board. Measure out 7-1/4 inches from the corner of the square. Measure out from the side 10 inches (the depth of the steps). Trace along the edge of the square to mark the cut line for the stringer. 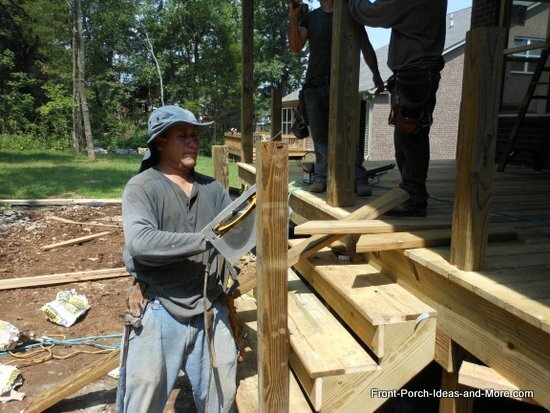 Note: You will not need a riser for the top step as it is attached to the porch framing. Draw lines for the remaining cuts the same as above. Lastly create another return. This part of the stringer that sits on the ground. 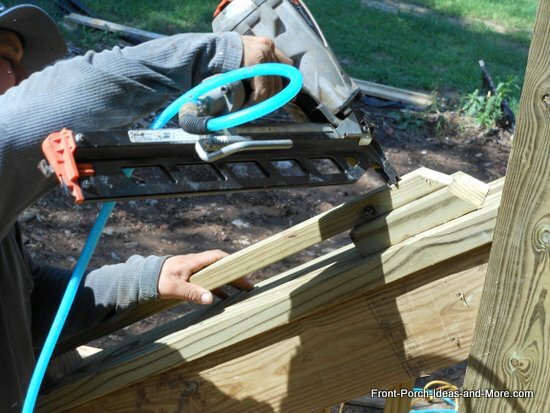 Using a circular saw, cut along the lines. Use a jigsaw to finish the cuts. 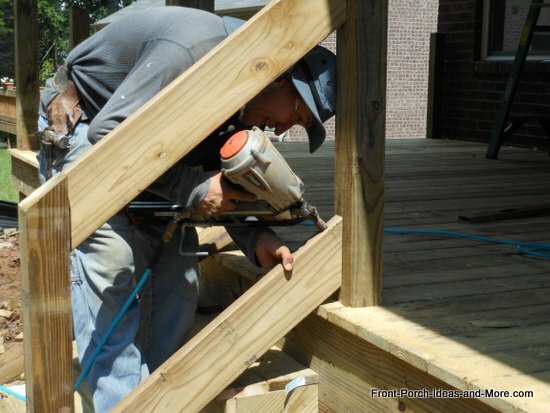 Here's a handy stair calculator you can use when building your steps. 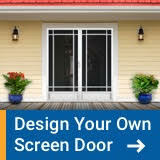 But always check with your local building officials to make sure you are building to code. 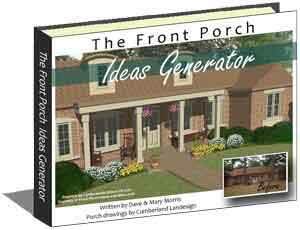 Attach the stringers to the porch and landing with galvanized deck screws or nails. 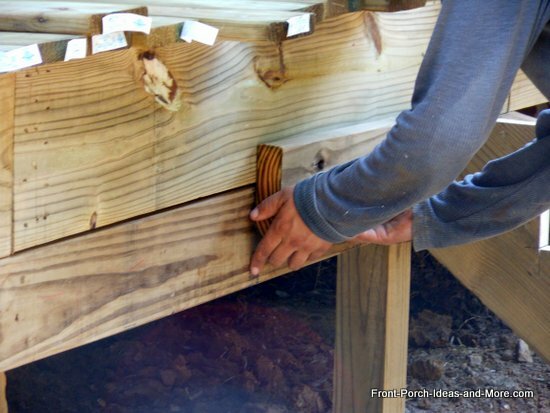 (Recommend attaching a ledger to the front of the landing or deck for added support). 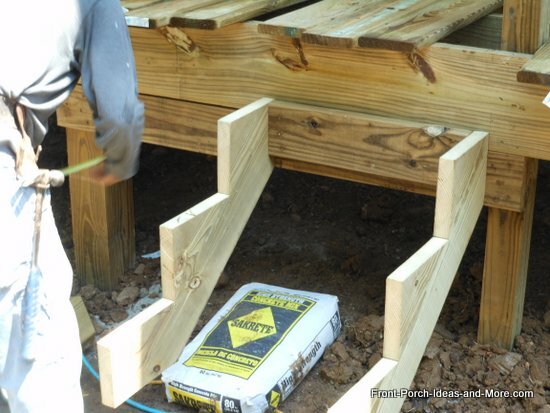 We recommend using 2x6 inch treated lumber for your treads. You can also purchase pre-made treads. Overlap the stringers by at least an inch on front and sides. Fasten with galvanized deck screws. 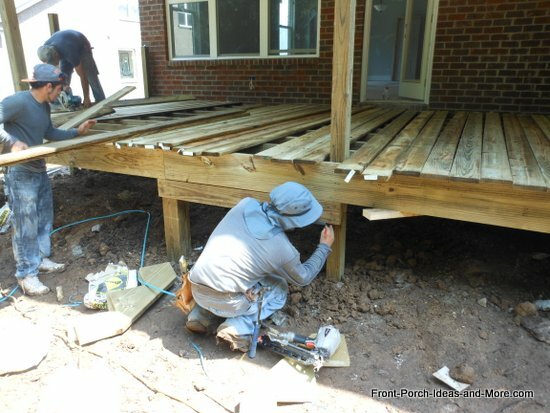 The ends of the stringers should rest on concrete pads to prevent settling. 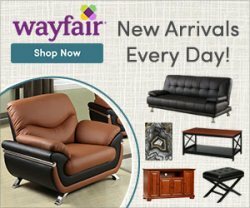 Our How to Build Steps Exclusive! 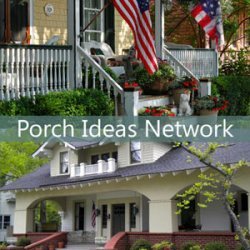 In most cases you have a porch or deck already built and are going to either build new steps or replace old ones. 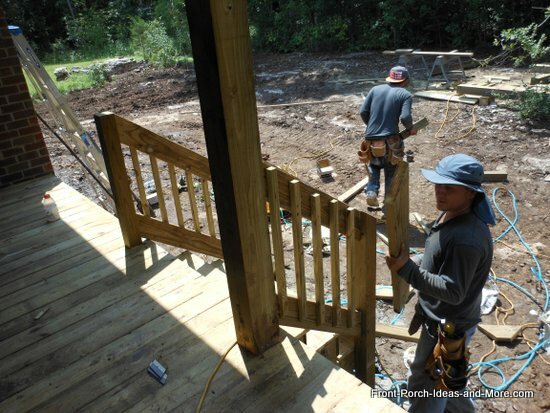 I'd like to show you a situation where, in this case, a back porch and stairs are being built simultaneously. 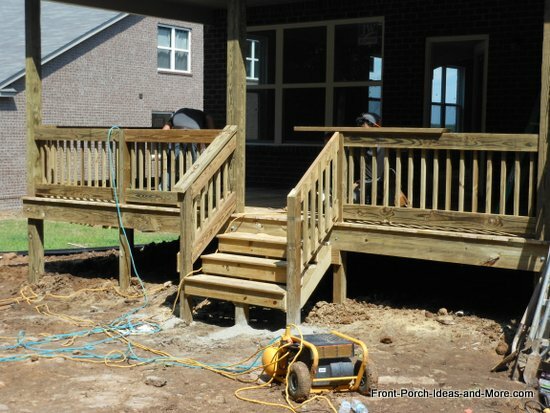 In addition, the steps will have to hang off the deck because the final grading for the yard is yet to be done. 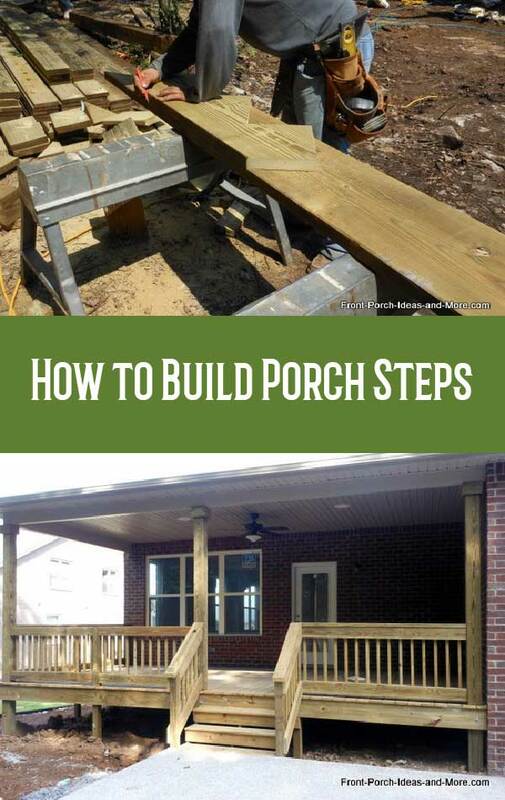 This is a unique pictorial guide on how to build steps. 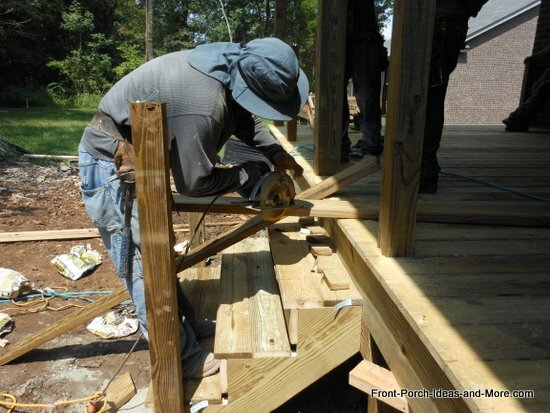 However, certain steps in the process you will see may not be permissible in certain geographical areas so please contact your local building codes department before you begin to ensure you steps will be to code. Blocking is being added between stringer locations to reinforce the stringers. Stingers in place with blocking and a riser to maintain proper stair width. Concrete is poured into the holes. 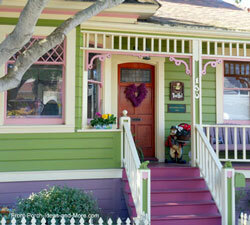 Note: Check with your local building codes to determine if this is an acceptable for your local area. 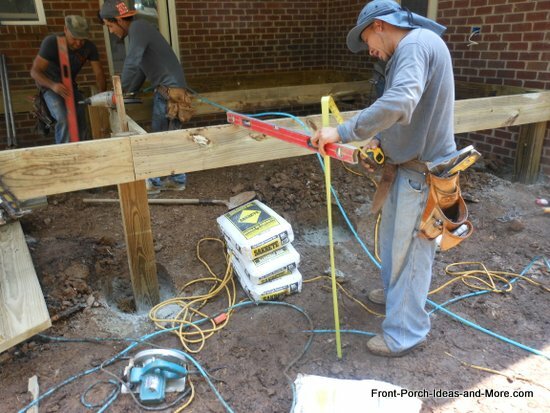 In many locations, you must dig the holes and have a building inspector verify they are at the correct depth and width before you begin erecting supporting posts or columns. 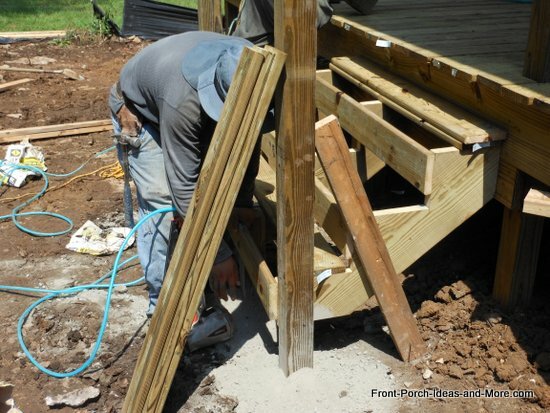 Posts are set in concrete and braced. Risers and treads are installed. 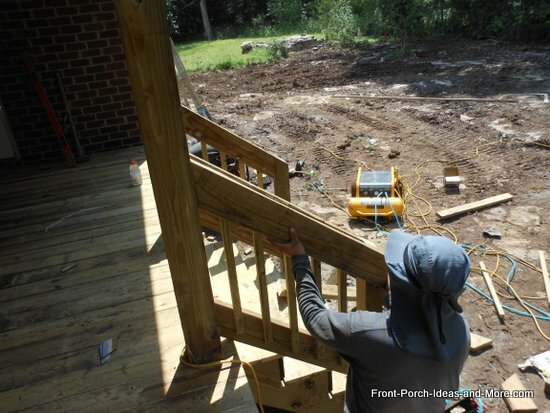 Pickets (or balusters) are attached to the top and bottom rails on each side of steps. The pickets are sandwiched between an additional top and bottom rail. 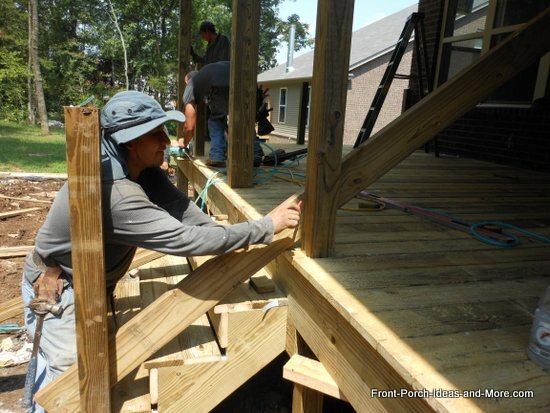 Hopefully, this gives you a good idea as to what is involved and now you know how to build steps. 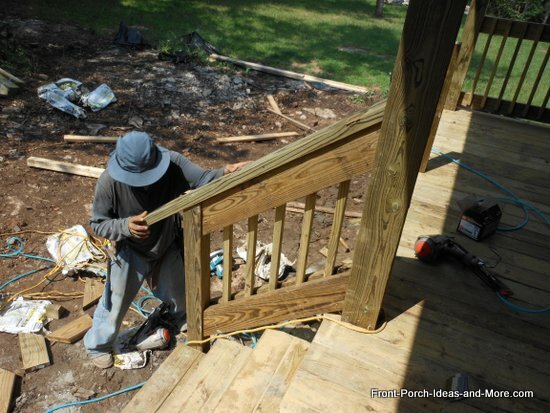 Whether for a front porch, deck, or back porch, the process for wooden steps is basically the same.